We know that your car is probably one of the most important items in your possession. You need to go to work, drive your kids to school, and we all know how much grief an untimely break down can cause. So what can you do to prevent this? The answer is routine general repairs. You must not wait for your car to breakdown completely before you come to us. 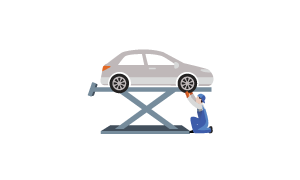 Our mechanics at Dr. Roadworthy are adept in handling general, small auto repairs that ensure that you do not have a major ungainly experience with car break down and then have to go through expensive repairs. Log book Servicing: We ensure that general servicing and repairs take place according to your log book records and that the schedule is maintained and the vehicle’s manufacturer’s warranty is kept intact. Tires: We provide the service to checking tire pressure and modifying it for proper running of the vehicle. We also inspect and prevent other potential problems that a defective tire can cause. Roadworthy Inspections: These are an important part of inspection that you need in order to know the working condition of your vehicle. We also provide Safety Certificates. Pre-purchase Inspections: While buying a used car you need to find out a lot more about it than going by its appearance. We provide careful inspection and impartial opinions, to help you decide if you are getting a fair offer. Holiday Pre-Travel Safety Checks: So you have decided to take a road trip with your friends or family. How will you know if your car is fit enough to take the brunt of a long journey? This is why we provide safety checks to ensure that you travel freely and without car troubles. Diagnostics: At Dr. Roadworthy, our mechanics are experts in inspecting vehicles are finding out the problems and potential problems with its working. Safety Certificates: After proper inspection and checks we issue safety certificates which are especially useful if you decide to resell your vehicle. Fleet management: Apart from single vehicles, our mechanical team is adept in inspecting and maintaining the smooth running of fleets of vehicles. Trailers and Caravan Repairs: At Dr. Roadworthy, we believe in providing our customers with a comprehensive service. This is why, besides cars and motorcycle repairs, our mechanical team has the technical and practical knowledge to deal with trailer and caravan repairs as well. We believe in quality service and customer satisfaction is our main aim. Our team of mechanics is specially trained and possesses a combination of technical and practical knowledge. We take our job very seriously and never perform any repair without your consent. There are 0 comment. on "General Repairs"